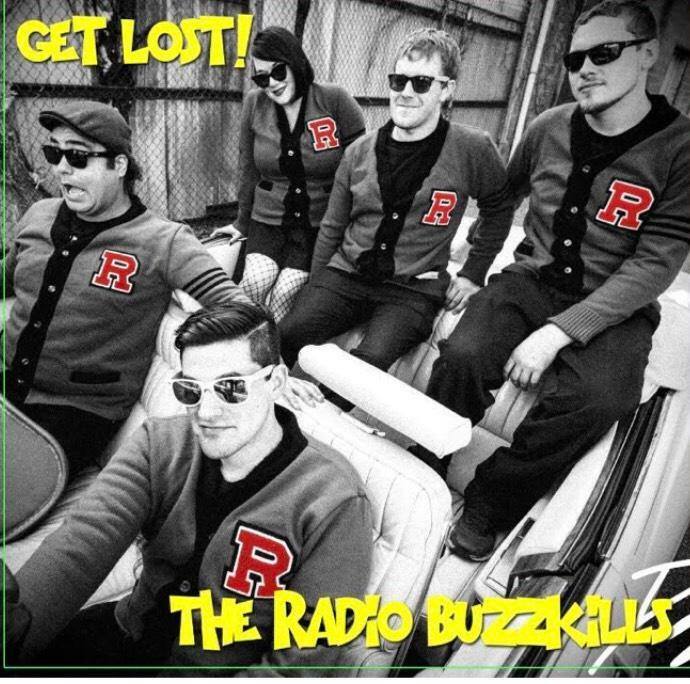 THE RADIO BUZZKILLS – Get Lost! Instead of relatively slick pop-punk, 2019’s ‘Get Lost!’ is rough and ready, with a dozen tunes spawned from the rawer end of the Ramonescore spectrum. With everything recorded live in the studio and with no time for too many obvious overdubs, it’s a pretty close representation of what you’d experience if you went to see the band first-hand…and with a bunch of songs partly inspired by B-movie subjects (sharks, vampires, cannibalism) it’s a much trashier record all round. All very much on purpose…of course. The opening number, ‘Tattletale’, is one of the Buzzkills’ best tracks to date, drawing very heavily on one or two old Screeching Weasel numbers as a reference point, then applying a sneering edge that just oozes attitude. Zac’s lead vocal is nasal and bratty, as befitting a song about back-biting, gossip and he said/she said bitchery, but bassist Jen is on hand with a fantastic melodic counterpoint on a chorus that’s kind of the punk equivalent of an old Shirelles melody. Musically, it zips along at a fair old whack, much like Weasel’s ‘Kamala’s Too Nice’ and ‘I Wanna Strangle You’, giving the rhythm section – powered by drummer Bass Amp (yes, really) – a ferocious workout. From that point, the record barely lets up, with a speed and gruffness very much dictated by the no-frills recording style. ‘She Hails Satan’, a tune that’s been in the live set since the release of the previous album, presents a mean snare drum and power chord combo which at first sounds as if it might be a little too by-numbers (especially if you’re a fan of various 90s punk bands), but things turn heel after a reasonable chorus with a great bridge that, again, owes more to 60s bubblegum pop. The contrast between punk and pop in the Buzzkills universe has never felt wider, yet at the same time, they more than make this contrast work through sheer guts and some silly lyrical concerns. An instant punk classic with a very literal title, ‘She Died On That Death Star’ mourns the loss of a girlfriend when the Rebel Alliance came in for their attack. You can’t go far wrong with a hugely unsubtle Star Wars homage colliding with a Ramones inspired tale of heartbreak, especially when the music almost reaches the perfection of the previous LP. Delving further into the rougher end of punk-pop, ‘This One Is Bitter’ makes no attempt to hide Zac’s general obsession with Screeching Weasel, but is none the worse for that. With a selection of gang vocals and a savage hook suggesting happiness would come by never seeing someone again – possibly the “tattletale” from earlier – the general lashing out combined with a superb speed delivers a genuine classic. More Weasel love powers ‘Cannibal Girlfriend’ which wears its influences very proudly, but in many ways it’s very much Buzzkills by numbers. The combination of another simple but lovely backing vocal and angular lead guitar just about makes up for the lyrical silliness and at the point where it all feels as if it could just blend into generic indifference, Zac and Jen wheel out some truly infectious “na na na’s” to pull the listener right back in. …And its a trick that really works. ‘The Difference Between Us’ chugs away like an old Queers cast off and truthfully sounds like something left over from the previous album. It’s fine for what it is, but is very much the kind of tune that would’ve benefit from some actual polish, despite some brilliant old-school “shoo-bop” vocals doing their best to save face, while ‘Vampire of Sacramento’ compliments ‘Cannibal Girlfriend’ with a world of Weasel oriented spikiness and horror inspired lyric. …And if Zac sounds even more like Ben Weasel in a bad mood than ever here, it’s got nothing on ‘Cold And Lonely’, a blatant attempt at tapping into more material from Weasel’s own ‘Anthem For A New Tomorrow’, but with added severed heads and female vocal counterpoints…and even then, those are a dead ringer for ‘I Wanna Strangle You’… There’s little more to be said here, since if you own any of the band’s prior records, you’ll have heard and loved something very, very similar, but in lots of ways, that’s fairly typical of the genre. For those looking for a bit more variation, ‘Gone Gone Gone’ cranks up some rock ‘n’ roll vibes, allowing Bass Amp to smash the hell out of his drums and for lead guitarist Jesse Buzzkill to throw out lots of fantastic reverbed lead work. Despite some great, frantic playing from all concerned, it’s Jen’s harmony vocal that leaves the most indelible mark and the way she shifts from her usual style into a controlled yelp gives the number a truly fantastic quirk. In many ways, ‘Gone Gone Gone’ would stick out half a mile as being the odd man out here, if it weren’t for the brilliant ‘Shark Surfer’, which provides a highlight with a near instrumental tune that’s heavy on some expected surf vibes. It provides a great insight into the band’s musical skills once they start to think further beyond their usual comfort zone. In a very calculated two and a half minutes, the hefty Ventures-esque twang delivered by guitarists Jesse and GG Buzzkill evokes the finest in garage surf sounds while Bass Amp, once again, locks down a great rhythm. It’s nothing new or especially out of the ordinary genre wise, but it’s something these guys do surprisingly well. Closing the record, ‘Unsolved Mysteries’ opts for something a little more mature, as the Buzzkills settle into a punk-fuelled power pop workout that really showcases the off-kilter harmonies that seem more intrinsic to the band’s sound than ever. It’s gruff and loud, but if you can make it past a razor blade of a lead vocal, there’s a lot to enjoy here…and by ending with something with a fuller melody, it guarantees fans will want to head straight back to ‘Get Fired!’ and then play the two albums back to back. So, ‘Get Lost!’ offers not so much of a musical progression as a defiant side-step. If you enjoyed the bigger choruses of the previous record, this’ll take a little longer to embed itself, but in terms of speed, riffery, snottiness, Weasel-baiting and a little punky accusation, it’s got all the important stuff more than covered. Whatever your preference, if you’re a Screeching Weasel fan, you need this record. It’s flawed and ragged, but still better than anything Ben has recorded himself since ‘These Ones Are Bitter’ back in 2007. This entry was posted in Album & EP Reviews and tagged pop punk, punk, st louis, the radio buzzkills by Real Gone. Bookmark the permalink.